This month's Is My Blog Burning theme, hosted by Clement over at A La Cuisine! is TasteTea - any dishes made with tea. During my recipe search, I came across a rice salad made by cooking wild rice in tea, and I had a light bulb moment. I'd been eating a tea-less version of a tea dish all my life, and I just hadn't thought of it as a tea dish, even though smack in its Japanese name is the word for tea - OCHAzuke - Japanese tea porridge! The most recent 91st issue (yes, there really is 91 issues, published bi-annually...) of my epicurean bible, Oishinbo, had a whole chapter dedicated to the art of Ochazuke, and if you look really, really closely at this tiny picture on Amazon.co.jp, you'll notice that it is Ochazuke on the cover. I've never made this dish from scratch using real tea, so this will be an adventure, perfect for the IMBB occasion! I started by making the seaweed (nori) preserve (tsukudani) that goes on top (recipes are at the end). This is also the main seasoning. I crushed some rice crackers from Trader Joe's since something crunchy is absolutely key to this dish, but there is no way I can find those perfectly round Ochazuke rice crackers last minute around here. I knew I was OK with wasabi, since my mother sent me a life time supply of wasabi-in-a-tube a while back. I then had a panic moment when I couldn't find my stash of rice-popped sencha (toasted green tea - perfect bitterness to go with the umami-powered seaweed preserve), needed for the dish. Luckily, Anne had just come back from Boston and brought me some of tea from her favorite tea shop (any guesses? this is going to be a feature of its own, so I won't spill details here), and one of the tea she gave me was sencha. Lucky, lucky. Once the tea was brewed and the rice was cooked, I piled some seaweed preserve, wasabi, and rice crackers, followed by a generous pouring of hot sencha. Done. I'd share with you some pictures of the finished product, but alas, this dish needs to be consumed as soon as it is finished to be enjoyed properly... There was no time to be wasted for photo ops! This is such a simple dish, but it turned out to be quite satisfying. Most unbelievably, the bitterness of the sencha was totally gone, blanketed by the intense umami sensation of the seaweed preserve and the potent sting of the wasabi. That being said, the bitterness of the tea definitely contributed to the overall effect of the dish as a nice undertone and there is no way this dish can be made with boiling water instead of hot tea. My seaweed preserve turned out very well, and had I known that I could make it so easily, I would've made it for my grandfather who is no longer with us. Seaweed preserve is sort of like jam here, where it's entirely possible and relatively easy to make at home, but because jarred versions can be so readily purchased, most people just buy it at the store. My grandfather loved this stuff, and always kept various jars in his fridge. Here's one for Ji-chan!! 7. 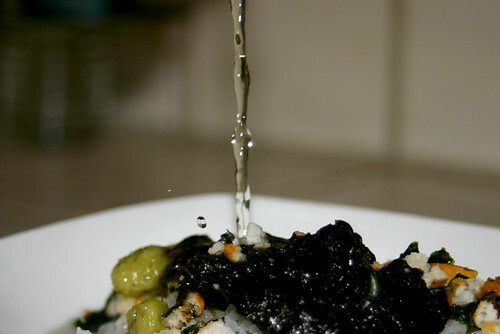 Cook until all of the liquid is absorbed and the seaweed has a very thick consistency. 8. Keep in an air tight container in the fridge. 1. Build the Ochazuke from top to bottom with rice, seaweed preserve, wasabi(or ume plum paste) to taste, and 1 tbs small bits of crackers. More seaweed preserve, wasabi or ume paste can be added later, so I recommend starting with less. For 1/2 cup cooked rice, I'd go with 2 tbs seaweed preserve and 1 tsp wasabi paste, 1/4 tsp ume paste. 2. Pour hot sencha tea, brewed strong. 3. Enjoy right away after mixing with your spoon! I'm, yet again, impressed with the quick dishes that the Japanese are so good at. I might be able to make this dish for myself, even. And it tasted so good, too. Thanks, The Baby Bear! Hey Alice, do you know were I can get ume? It's one of my favorite things in the world, and I'd love to have some at home to play around with. In the East Bay, it's a little bit trickier, since there isn't a big JPN grocery store, but if you go to the Japantown in SF, any of the Japanese grocery store will carry umeboshi (dried ume plum) or crused umeboshi in a tube. Let's get together in SF soon, and we can go shopping together! Hey, you've got a date! How 'bout this weekend, as a matter of fact? In the summer I have cold rice, with iced green jasmine or iced genmachai with Japanese pickles. Its so refreshing to eat and simple. I either buy the Japanese pickels at Japanese restaurant or I buy them at the Japanese market. I'll learn to make my own since it doesn't look to hard.